March 27, 2011: Many Magazines! This week e23 looks a bit like an old-time newsstand. Two magazines grace the digital shelves, so let's leaf through them until the clerk asks us "You gonna buy that, or what?" Why am I excited? Not one, but two articles by David Pulver . . . and an article by Jason "PK" Levine -- both these guys know their GURPS, and have experience fitting rules to brain powers. Add those to "Expanded Psychokinesis," "Thoughtjustice," and "Random Psionic Tables" -- well friend, you've got a magazine pumped full of mind-reading, object-levitating goodness! My enthusiasm for Pyramid shouldn't distract you from the gem that is Space Gamer #64. 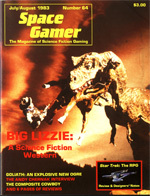 All the news and reviews that was fit to print back in 1983, each issue of Space Gamer is a time-capsule coming through a portal on the back of a Gallifreyan. On top of that, this issue features rules for a variant Ogre, the Goliath -- quite fitting, considering the recent announcement. Oops! The clerk is starting to notice us! Time to grab these two and head for the check-out button!